This week’s photo reminds me of the waves of sweet, musky tobacco smoke I sometimes encounter when walking down the street — an experience that is becoming increasingly rare. It was taken in Freiburg, Germany, by Flickr user vaquey. 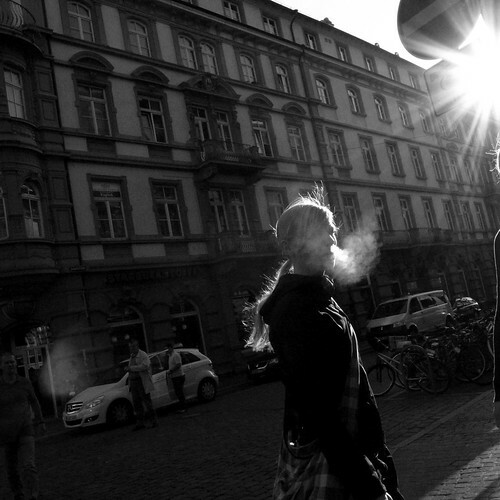 This entry was written by Christopher DeWolf , posted on Monday April 18 2011at 07:04 am , filed under Europe, Public Space and tagged Freiburg, Germany, Photo of the Week, Smoking, Streetlife . Bookmark the permalink . Post a comment below or leave a trackback: Trackback URL. What an unusual feeling. I never find people smoking good to see, but this time I find it very beautiful. Thanks.